Black Rock City only really needs three kinds of furniture: seats, beds and bars. We’ve got the best seating and convertible beds this side of Reno, so before IKEA can challenge our dominance in Playa furnishings by exploiting a hole in our product line, we decided we’d better design a collapsible, burnable bar! Here it is – it will collapse only when requested to unless it is subject to forces beyond our control. 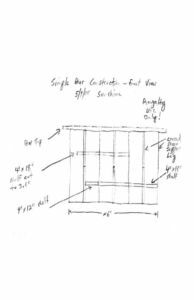 It should work with most any bar top your artistic staff might create or scrounge (you can use plywood for the bar top as shown in the plans, but that would be so damn boring). Cut the rectangles first like you do for all our other fine furnishings. Clamp several pieces together to cut the curves quicker, and assemble. 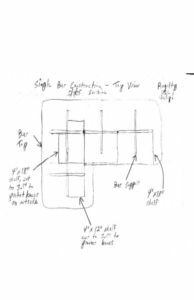 The cutting drawings here yield four bar supports with one shelf and an 8′ bar top from three sheets of ½” plywood, but this is the kind of project that invites you to lay out the modules however you like! 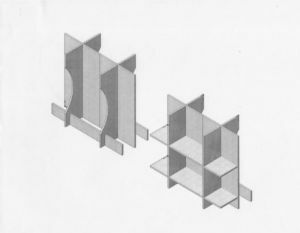 The top and front views in the plans illustrate one of many ways a corner can be made using interlocking shelves to increase structural support. 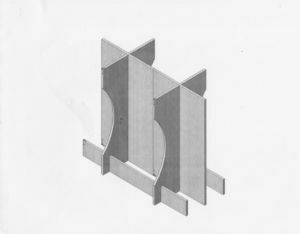 Some configurations may benefit from additional modifications to the standard parts, such as extra slots, shortening shelves, making 8 foot long shelves by cutting your ply the long way, or adding foot rests. Do it pre-playa to avoid sawdust moop. Secure the bartop to the assembled supports and shelves using angle brackets or whatever else you like. We recommend you seal the bar top and shelves, or they may delaminate and warp with that heavy spillage we know goes on in the wee hours. 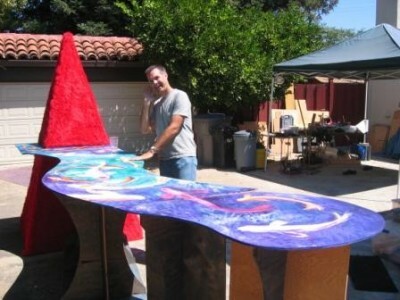 Like all our innovative products, we request a $5 royalty for each sheet of plywood used, paid to www.blackrockarts.org. 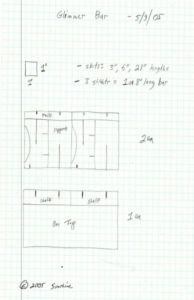 We also request a mail to sunshine@playatech.com illustrating your design and indicating the planned location of the bar at Burning Man. This will enable our expert staff to make an inspection visit and ensure your bar passes our stringent engineering requirements and stress tests, which will be memorialized with a burned Logo logo. Unregistered Glimmer Bars found at Burning Man constitute a Playamark violation and may be stress tested without notice. Note that it is a violation of Burning Man event policy to burn your bar in place if doing so will create a danger, and forms are required just to try.